Originally built in 1938, this beautiful home sits on over an acre lot in the center of the City and is a Registered Historic Landmark. We are proud to have honored the original structure of the home while substantially updating the kitchen, baths, bedrooms, living, dining areas and more. The formal living area features the original wood trusses and refinished, oak hardwood floors. The new steel windows and doors open up the room and offer a fantastic view of the back patio and yard. This gorgeous and grand entry features the original front door to the house and a stunning starburst chandelier. Check out the door under the stairway. With touch latch entry, it leads to a basement wine cellar! The formal dining room makes a wow-statement with the custom wallpaper and fabulous brass and glass chandelier. A major re-design of this area created a fantastic open-concept space for the family. All new windows and doors on the left with all original windows on the right side of the room. The view from the opposite corner shows off the wall of windows facing the street and the sunken family room. With side by side refrigerator and freezer, this kitchen is ready for action. Counter space is abundant with the center island. The antique mantle has a special history, once belonging to the homeowner's grandmother. What was once a built in entertainment cabinet is now a fabulous bar with mirrored walls, glass shelving, marble counter top, ice maker and refrigerator. Un-lacquered brass is all the rage in Austin right now. This homeowner has added just the right touches to the powder bath. The warmth of the brass and wood provide the perfect balance with the cool grey in the vanity and marble top. This large Master Suite offers a lovely fire-side sitting area and access to the back yard through french doors. The sitting area of the Master Suite is the perfect place to curl up with a good book. A spacious and glamorous master bath resulted from a complete re-design of the space. The doors lead to separate His and Her walk-in closets. Each vanity space is accented with a beveled mirror "frame" on the face of the mirror. Lining the back wall are marble matchstick tiles. The floor tiles are grey marble planks in 4" x 24" size. 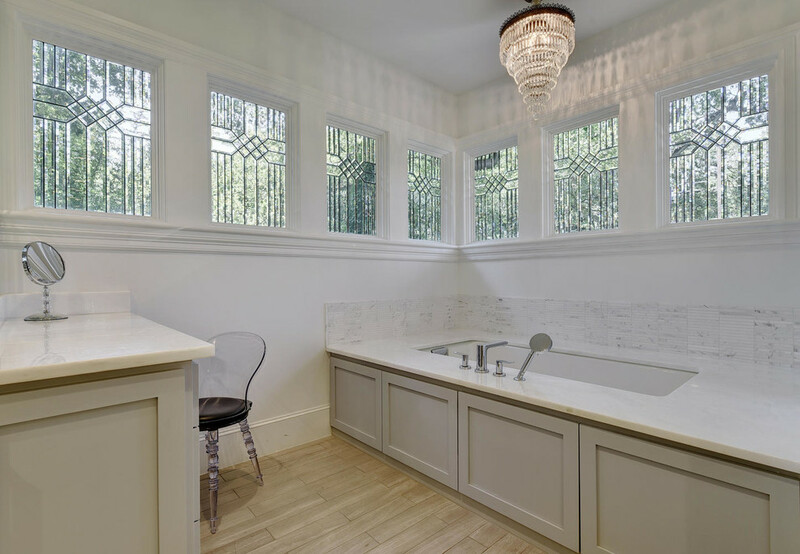 These fabulous leaded glass windows are the only part of the original bathroom that remains. Offering privacy and natural light, the beveled glass is gorgeous as you move about the room.